Sometimes my eyes flutter open and I am instantly filled with the pain of the day before. Depression has invaded my heart a time or two or three before, but this time that isn’t it. The truly difficult things in life are not elusive, they are your final thoughts as you finally drift into a state of peace until you are only greeted by the same thoughts the moment you awaken to the war in your mind. Dreaming Daughter brings me a tiny bouquet of flowers from the field nearby, she knows my pain and sees right to the heart of me. I thank her for the flowers and stare at them as tears fill my eyes as she runs back to play. I lost it this week after listening to Little Brave tantrum over Lord Knows What for 30 minutes smack in the middle of Morning Time. The next kid says that wrong thing and BAM, who even am I anymore? For a moment I had to leave the room to collect myself, of course I took it out on the wrong kid, I hate it when I do that. Back downstairs with fresh coffee in hand, humble pie in my heart and a fresh start with Tenderhearted Guy. Apologies made, I hold his lanky 6 year old self in my lap for 10 straight minutes until I asked him go grab a book to read out loud to his Mama. He choose “Are You My Mother?” and cuddles right back up with me. He reads the well loved story of a baby bird off to discover who his mother is, only to leave me wondering why I got so lucky to be a Mama to these 4 amazing kids. Tantrums and all, me included. Kids are so forgiving. Last week it was Little Brave climbing out of his crib at night and this week it is Little Brave biting his sisters. We always said we’d never put up with a biter. I’m never sure why we make such declarations anymore, only to have “that” child instantly fall into our basket of parenting problems to solve. It’s like one of those lotto balls that bounces around until it falls in just the worst slot. This week was spent disciplining him whenever he bit as well as consoling the victims. Lots of time outs for Little Brave as he screamed in his room and tears from his Mama while I call out to Jesus to once again meet me where I am. Right here in my own personal weakness. Because on top of that we were all sick from the cold all the way to my husband coming down with the worst case of the flu I have ever seen. I got medical news that left me feeling broken, hurt and not enough. I am OK physically but it was the emotional heartache kind of news, but that is another post for another time. It was an Enough is Enough kind of week. These are the moments those in church try to pretend we never have. Sunday smiles and chin up! We tell ourselves the church doesn’t need to be burdened by our problems. Why don’t we see the value in ourselves that Jesus sees? Being a woman can feel so devaluing in our culture for so many various reasons. This has resonated to every part of me, including my so called “problems” and worth. Who wants to hear how I’m really feeling? I tell myself no one but I know that’s a lie. Compliments leave me perplexedly feeling unrest inside. Do any of us care about what really matters anymore? Because it isn’t any longer about who we are, it is about what we do. Congrats on the Blog! Nice work on becoming a Consultant, it will be nice to (finally) earn some extra money. What a delicious meal, you always know how to host a great dinner. The house is looking so nice! Best Chocolate Chip Cookie baker ever(my sister and I still contend for that title)! These are all nice things to say, wonderful compliments. There is a Holy Spirit feeling inside that has been telling me there is more. When your world feels like it’s falling apart, it brings you back to the most raw part of who you are. What you do is only a daydream. Will my character stand up to the test of what I am going through? Will I allow God to work through this, within me, so His glory can be made bright and beautiful? Can I show kindness to others hurting deeper than I am, even in the midst of my own pain? While waiting for the Holy Spirit to shed light on my next big decision. Can I stay focused on building my house up with encouragement even when my insides feel down? These are the moments true character is shown. But guess what, He values you anyway. 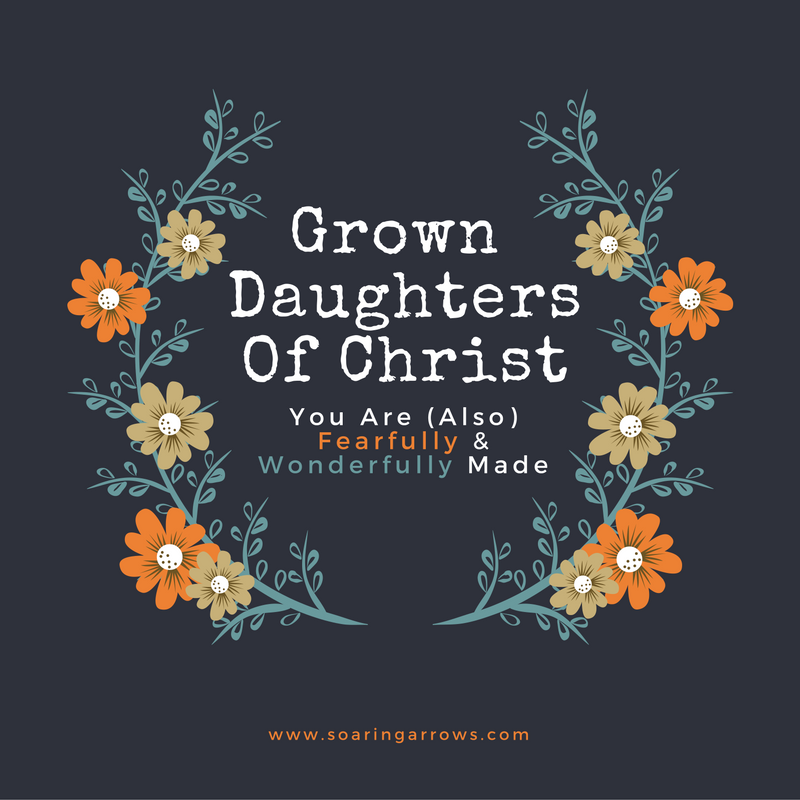 We tell our children they are fearfully and wonderfully created by God, but Mama and sweet Daughter of Christ, do you believe that for yourself? Do you hold that truth close to your own heart? God created you without fear. He created you to be wonderful, right from the start, despite all that sin. We praise Him because he created us the way we are, not because of anything we do. Do you know that full well? When the sink is full of dirty dishes, the laundry isn’t caught up and there is no dinner on the table. When “all you do” is take care of your kids, without anything else on top. If “all you are” is a Homeschool Mom at home, pouring any wisdom you can muster into your kids each day. If your season of life doesn’t currently allow you to pursue you dreams and passions. When depression overtakes you day after day. When you cannot carry a baby through a full term pregnancy, or cannot get pregnant at all. If your spouse has left you and you are sure it’s all your fault. Even if you screw up in your sorriest state of motherhood, womanhood or sisterhood. God already knew you were going to do that, he still created you and isn’t even afraid of you. It’s less about what I do and more about who I am becoming in Christ. This doesn’t mean we throw our hands in the air and just don’t care. It means we throw our hands in the air and give praise to the God who created us despite our inadequacies. A God who values us wonderfully and fearlessly. Thank you, friend. Praying for you. Thank you for sharing. I am a mom of one child, who is no longer a child 🙁 but a legal adult at age 19. She was a handful from the very beginning and I can’t even count how many times I told God that I was not cut out for this job and that he’d made a mistake. I’m still not totally convinced that this child wasn’t intended for someone much better at this mom thing than I was, yet I am still grateful for the opportunity to be her mom. She still is a handful, pushing against all I/we ever taught her … fighting for her own independence and against all authority. All this to say, that when I say thank you for sharing, I mean it from the bottom of my heart. Thank you for letting me know that I’m not alone out here wondering how a mom could be such an epic failure and for reminding me that God is not surprised by any of this. Thank you for being real so that real people can relate and feel with you. God bless you, and your family. Thank you so much for sharing this! God choose you for a reason to be the mother of your daughter. God bless your family as well! I’ve never understood why we assign that Psalm 139 passage to kids and kids alone, yet I still find myself in need of the reminder that it applies to me too. Every. single. day. I know I need the reminder too! We often forget that God’s promises to our kids apply to us always. “It’s less about what I do and more about who I am becoming in Christ.” I love it!